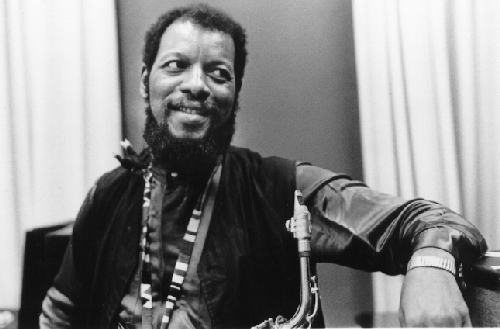 Ornette Coleman was born in Ft Worth, Texas, on March 19, 1930, his father (who died when he was 7) a cook and later mechanic, his mother a seamstress. The deep-seated blues tradition which has colored the playing of generations of "Texas tenors" is thus a birthright. Coleman started on alto saxophone when he entered high school, making rhythm and blues gigs on it and later on tenor. Later, still a teenager, he was introduced to the bop revolution by saxophonist Red Connors, which significantly broadened his musical horizons, although his performance opportunities around Ft. Worth remained limited to the r & b gigs. Coleman went on the road around 1950, but his original and somewhat eccentric style was not conducive to permanent employment. After losing his tenor in a beating administered by unreceptive roadhouse patrons, he was stranded for about six months in New Orleans, where he borrowed a friends unused alto. From New Orleans Coleman traveled to Los Angeles with a group whose leader was paying him not to play by the time they reached the coast. After a two-year return to Ft. Worth Coleman moved to LA for good, rooming with drummer Ed Blackwell (whom he had met in New Orleans). For the next half-decade he continued to struggle to be heard, the alienation fostered by his developing music only intensified by his unusual long hair and home-made clothes. He met and married Jayne Cortez, and the couple had one child, Denardo, born in 1956. Coleman's approach began to attract other Angelenos, notably trumpeter Don Cherry, drummer Billy Higgins and bassist Don Payne. In late 1957 Payne brought a prominent local bassist, Red Mitchell, to hear Ornette. Mitchell, more impressed by Ornette the composer than Ornette the saxophonist, in turn arranged for Coleman to show his compositions to Lester Koenig of Contemporary Records. Koenig, impressed by both the compositions and their performer, arranged an audition for Coleman's rehearsal band, and recorded them early the following year. Favorably reviewed but commercially unsuccessful, the first album brought only sporadic work (including a gig with pianist Paul Bley at the Hilcrest Club in LA, where Coleman first met bassist Charlie Haden), but it did bring some local acceptance. Bassist Percy Heath and later pianist John Lewis (both of the Modern Jazz Quartet) managed to hear Coleman one evening as he sat in at the Jazz Cellar and were very impressed. Heath participated a second Contemporary recording (early 1959) and Lewis arranged a recording contract for Coleman with Atlantic and later a trip east to participate in the Lenox School of Jazz (Massachusetts) in August. Eventually, with two more albums recorded for Atlantic, Coleman and his quartet (Cherry; bassist Charlie Haden and drummer Billy Higgins) came to New York City for a two-week engagement at the Five Spot in November 1959. That controversial appearance at the Five Spot (which stretched out to ten weeks) is legendary. Coleman's occasional use of the non-tempered scale (notes sounded at natural rather than well-tempered pitch), his abandonment of chord changes and the conventions of the 32-bar AABA song form, and the improvised interplay amongst the members of the quartet, among other characteristics, produced strong reactions (both pro and con) from musicians, critics and listeners. Propelled by the publicity-building controversy, Coleman and the quartet worked regularly through the following year, recording frequently (the prophetically named Free Jazz, for a double quartet, proving especially influential). But a backlash of sorts seems to have begun in 1961, a rejection of the innovations proposed by Coleman (there were similar reactions to John Coltrane that year). The contract with Atlantic ended in the spring of 1961. Coleman's group changed faces (Bobby Bradford replaced Cherry; Haden was followed by Scott LaFaro, Jimmy Garrison and David Izenzon), and when Bradford returned to Texas in late 1961 the group became a trio. During 1962 the group appeared only twice, once during the summer for several weeks at the Jazz Gallery, and late that year in a self-produced concert at New York's Town Hall, built around a trio with Izenzon and drummer Charles Moffett. The December Town Hall concert, an artistic success but a financial wash, proved to be Ornette's last performance for some two years. Outside factors-the loss of work as the controversy died down, the critical backlash, Coleman's inability to obtain what he considered appropriate compensation, the problems of leadership-played a major role, but Coleman himself seems to have chosen to withdraw. During the interim Coleman taught himself to play trumpet and violin. Coleman reappeared briefly for several weeks at the Village Vanguard in New York in January 1965, garnering interest and drawing a good audience. He seems to have resolved to move to Europe, and a movie project provided sufficient funds to get him to London in July. Moffett and Izenzon joined him in August and (by getting himself classified as a "concert artist") Coleman was able to perform in England August 29. The trio seems to have wandered through Europe like nomads that fall, playing in France, Spain, Switzerland and Scandinavia. Blue Note had been interested in the 1962 Town Hall concert, but contractual problems prevented the release. Instead Blue Note agreed to record the last two nights of the trio's appearance at the Golden Circle, in Stockholm, Sweden, in December 1965. The first of two volumes appeared before the trio returned to the United States in May of 1966, and received very favorable reviews. (The trio's soundtrack for the movie Who's Crazy , recorded around the same time, is also notable). Bouyed by the success of the Golden Circle releases, the trio spent the balance of 1966 working regularly (if not constantly), performing in New York, Los Angeles and San Francisco. In September Coleman went into the studios, choosing to record with an unusual trio of bassist Charlie Haden and ten-year old son Denardo on drums. Coleman ended the year a poll winner in several categories, and early in 1967 he was the first recipient of a Guggenheim Fellowship for jazz composition only. Ornette added Haden for a March concert and recorded as a sideman on trumpet with alto saxophonist Jackie McLean. For the next year and a half Coleman was relatively active, traveling to the West Coast, Japan, back to Europe and performing at various East Coast locations, in groups which included Dewey Redman or Don Cherry, Haden, and son Denardo, Ed Blackwell, or Billy Higgins. He also composed a number of different symphonic works, and recorded in the studio in 1968 for BlueNote. After several months off, the quartet plus Don Cherry played a memorable concert at New York University in early 1969; the next appearances were not until a brief European tour in August. The first of several significant events for Ornette occurred before the end of the decade, when Coleman bought the apartment he was living in at 131 Prince Street; by the end of the decade he had purchased the storefront below it. The Prince Street location, under the name Artists House, became the site of various performances by Coleman and others over the next few years. In 1971 Coleman performed for the first time at the Newport Jazz Festival (in Newport RI). Later that year Coleman briefly signed with Columbia Records, recording in late '71 with a variety of small groups. Immediately thereafter Coleman took a quartet to Europe as part of George Wein's annual Newport Tour. Following the tour Coleman visited Nigeria. A second significant event was the chance to record a major symphony, Skies of America, in April 1972, in Paris (with the Londa Symphony). The work received its first public performance in July at the Newport Jazz Festival (now in New York City). The work brought with it Ornette's first discussion of what he called the Harmolodic Theory, which attempts to explain his approach to music. Early the following year, at the instigation of author Robert Palmer, Coleman flew to Morocco to visit the Master Musicians of Joujouka (in the remote village of that name), a family of musicians who reportedly trace their ancestry back to Persia. Coleman composed music for and played with these musicians, and some of that was eventually released the following decade. The widely disparate experiences of working with the orchestra and later with the Moroccan musicians may have been a factor in Coleman's decision to add guitarist James 'Blood' Ulmer to the group in 1974 (as Haden and Redman began to play regularly with pianist Keith Jarrett). This transitional quartet evolved gradually into a seven-piece electrified group with Coleman, two guitarists, two electric bassists and two drummers. Coleman recorded a smaller version of the band in Paris at the end of 1975, in a group that would later be called Prime Time. The balance of this biographical sketch (covering the years 1975-1998) will be added at a future date. This biographical sketch is based on Ornette Coleman 1958-1979: A Discography, by David Wild and Michael Cuscuna (copyright 1982 by Wildmusic), with additional information from John Litweiler's Ornette Coleman: The Harmolodic Life. All the usual copyright restrictions apply.